Open-ended questions should be used to encourage a full and meaningful response that communicates the patient's understanding and feelings about their proposed treatment. These are the opposite of closed-ended questions that can be answered with a simple "yes" or "no" response. Such questions don’t encourage meaningful dialogue between patients and providers. Open-ended questions typically begin with words such as "why" and "how", or phrases such as "Tell me about _____." These types of questions encourage a more in-depth and lengthy response. Rapport between people is built when both parties are communicating. This type of questioning gets the patient talking. When patients aren’t communicating their feelings and thoughts about recommended treatment, you don’t know what their “objections” are, and you won’t be able to address these. 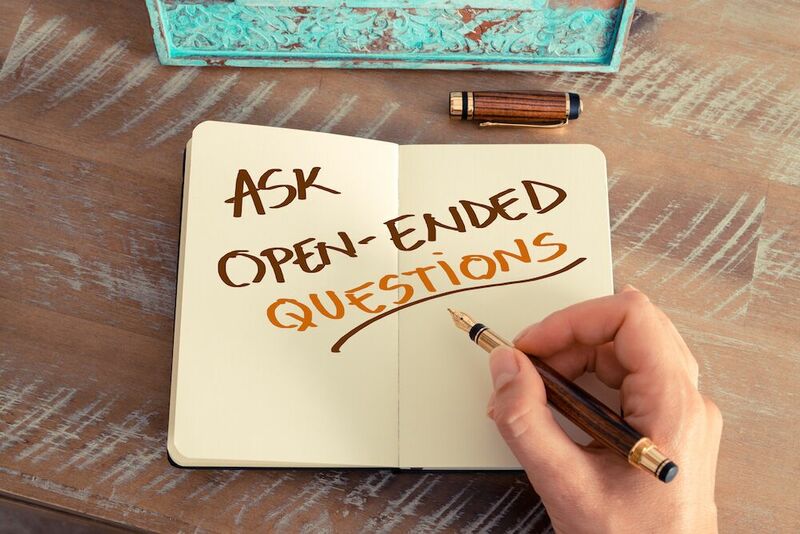 Open-ended questions help put patients at ease, and get them to openly communicating their dental concerns. I noticed you live in _____ (city or area). How do you like it there? How’s your day been going? How old are your kids? What do they like to do? What school(s) do they go to? What kind of work do you do (Have them tell you about it, what they enjoy, what they run into in that type of work, etc.)? How is your family doing? What are they doing? Where do they work or go to school? How did you find out about our office? What did they say about our office that got you to come in? What has your previous experience at the dentist been like? What brought you into our office today? Last time you were here, we looked at your doing ______. What thoughts have you had about getting this done? What are you most concerned with about your teeth? How would you like to improve your teeth, gums, or oral health? What concerns (or questions) do you have that would prevent you from moving forward with dental treatment? What do you feel might be the consequences of not doing this treatment (very important for patient to see)? When presenting treatment, you want to engage the patient in a conversation, not “talk at them”. Open-ended questions get the patient to participate in the conversation. It’s more of a discussion, as opposed to a one-way presentation. All staff, front and back, should know how to question patients in this way. It gets them feeling comfortable and more relaxed. This is fundamental to getting better case acceptance. For more information on effective case acceptance techniques, enroll in our Implant and Treatment Coordinator training programs today.